One of the frustrating things while traveling is getting a weak wifi signal in your hotel room. A good tool in that case is they BearExtender Turbo High Speed 802.11ac USB Wi-Fi Adapter for Mac OS X [BearExtender dropped support for Macs, link removed] (Windows version). Even though the mac version description says it is not compatible with Yosemite, the comments indicate an update was made January 2015 to make it work with Yosemite. 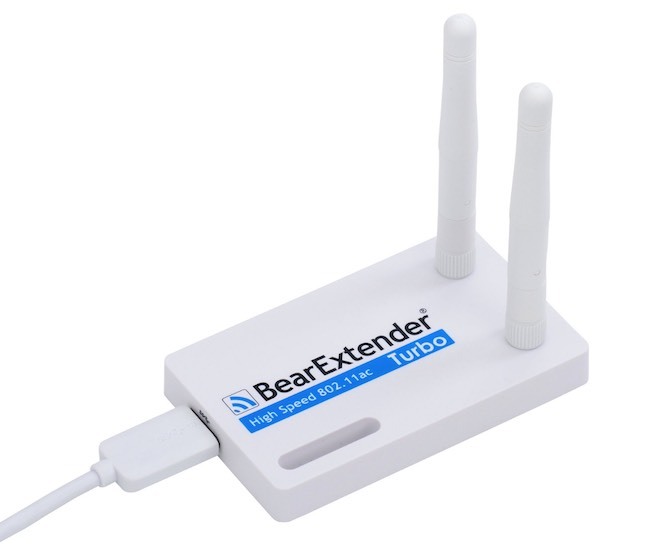 The BearExtender also works to provide better wifi signals around your house. Some models are designed to connect with your router (Netgear range extender, for example) and are not as suited to travel use as the others are). BearExtender can be used for travel or home. Alternative wifi extenders: Alfa AWUS036NH 2000mW 2W 802.11g/n High Gain USB Wireless G / N Long-Range WiFi Network Adapter with 5dBi Screw-On Swivel Rubber Antenna and 7dBi Panel Antenna and Suction cup / clip window mount, D-Link Wireless N 300 Mbps Compact Wi-Fi Range Extender (DAP-1320), NETGEAR N300 Wi-Fi Range Extender, Essentials Edition (EX2700) and TP-LINK TL-WPA4220KIT ADVANCED 300Mbps Universal WiFi Range Extender, Repeater, AV500 Powerline Edition, WiFi Clone Button, 2 LAN Ports. This entry was posted in electronics, internet and tagged computer, internet, laptop, wifi, wireless by curiouscat. Bookmark the permalink.